Due to popular demand I am sharing another coconut flour creation with you. Please keep in mind that this is not a very sweet treat. If you prefer your treats a bit sweeter, feel free to add some local honey, we buy ours from the Fish Hugger. This loaf is awesome as a breakfast alternative on those carb heavier days, a tasty treat or as a dessert with some freshly whipped heavy cream. As some of you are allergic to Almonds – this may be a great alternative for you. Beat eggs with a hand mixer until they are very frothy, then add all other ingredients, mix well and simply pour into your greased and coconut dusted 4 ½ by 8 ½ inch loaf pan. Bake for 30 minutes and let cool for 10 to 15 minutes prior to serving. If you don’t like the dried fruit, you can substitute it by adding the juice of half a lemon. Isn’t there supposed to be coconut flour listed in the ingredients? Where is the coconut flour? 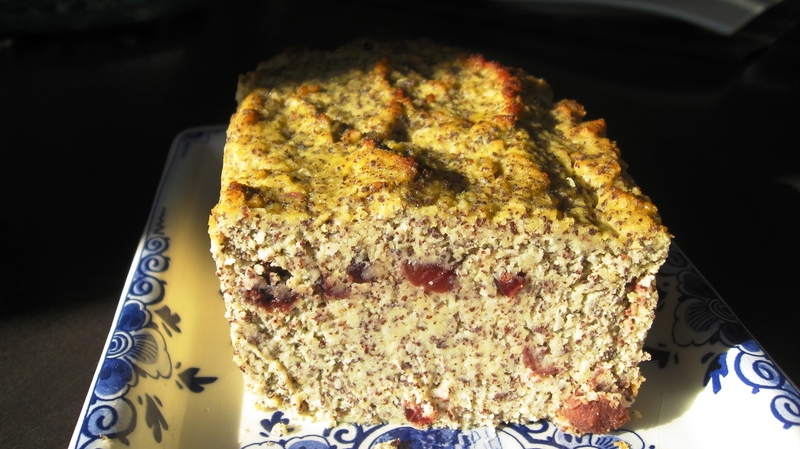 I make a similar loaf without the poppy seeds and applesauce. I’m going to add the poppy seeds into my loaf and let you know how it turns out!! How much coconut flour? And 1/8 cups is only 1 1/2 tbsp. That seems quite an insignificant amount for an ingredient for such a large loaf. Is this a misprint? It looks yummy. I make a similar coconut flour mini loaf without the applesauce. I’ve been looking for a yummy poppy seed cake that;s not lemon. I’ll try this with my variations and get back to you. Nice!! thank you. Not a misprint. I will repost this all together, as this is from quite some time ago. Please look for the new thread on this soon. Thank you!